1. Tender for Annual Repair and Maintenance Work for the period of one year 2012-13. 5. Invitation of sealed bid for "Multiparameter Monitor" under Two Bid System. 248/2011 ESIC Hqrs. 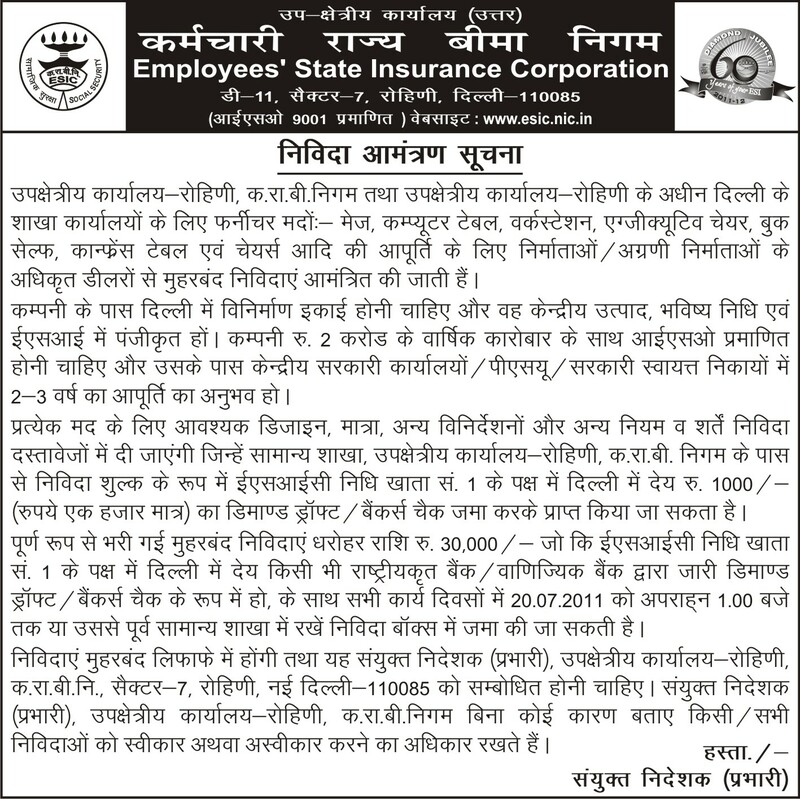 : Tender Notice for AMC of UPSes installed at ESIC Hqrs. 241/2011 ESIC RO, Tamil Nadu: Tender for the computers and peripherals etc. 236/2011 ESICH,Jhilmil: Tender Notice for providing House Keeping and Facility Management Services. 235/2011 ESIPGIMSR,Joka: Corrigendum on the subject Invotation to tender for providing tie-up services for Blood Bank facilities for Whole Human Blood and Blood Components for patients. 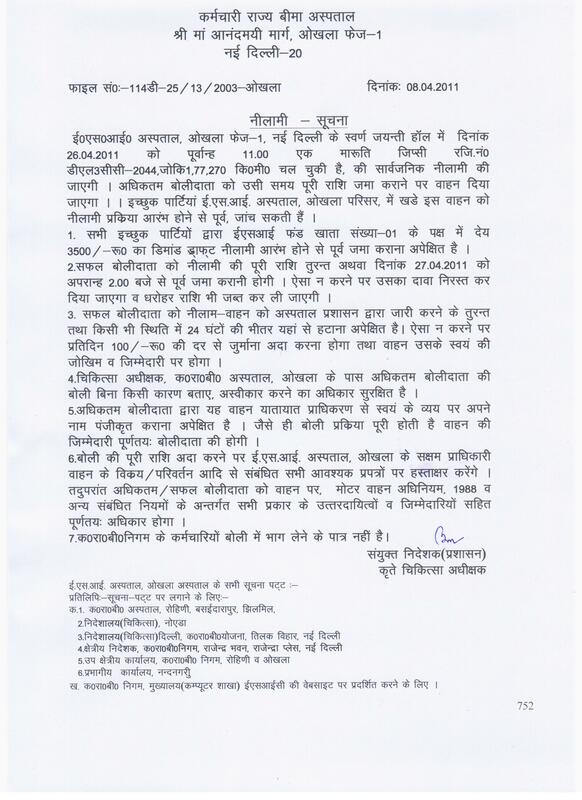 230/2011 ESICDC&H, Rohini: Tender for purchase of Dental Equipments, Medical Equipments etc. 226/2011 ESICH,Paripally, Kollam: Tender Notice for local purchase of drugs and dressings. 206/2011 IGESIH, Jhilmil,Delhi : Advertisement for providing House Keeping and Facility Management Services. 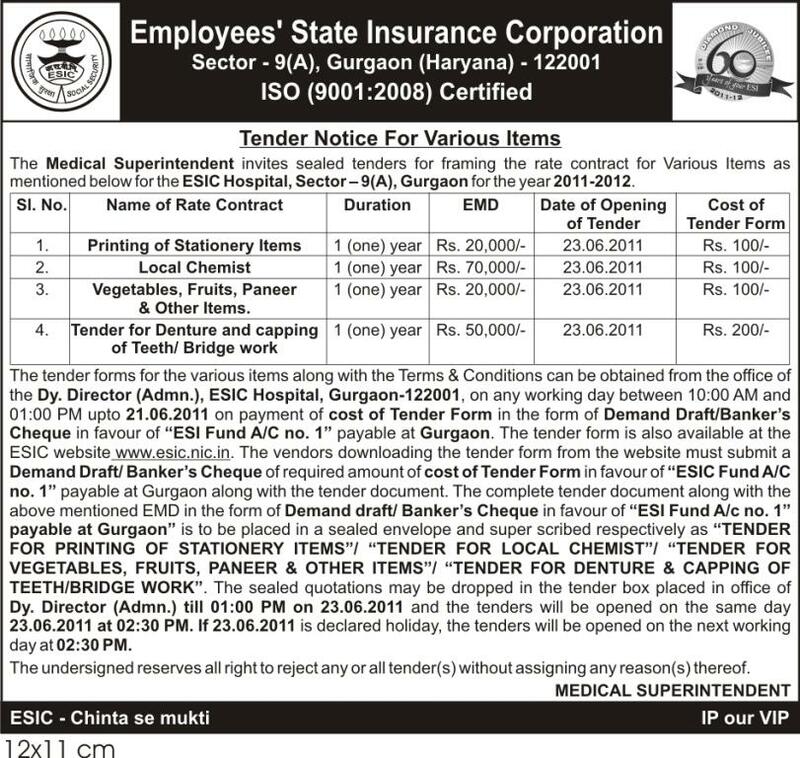 205/2011 D(M) NOIDA: Advertisement regarding Open Tender for carrying out laboratory Investigations under Two-Bid System. 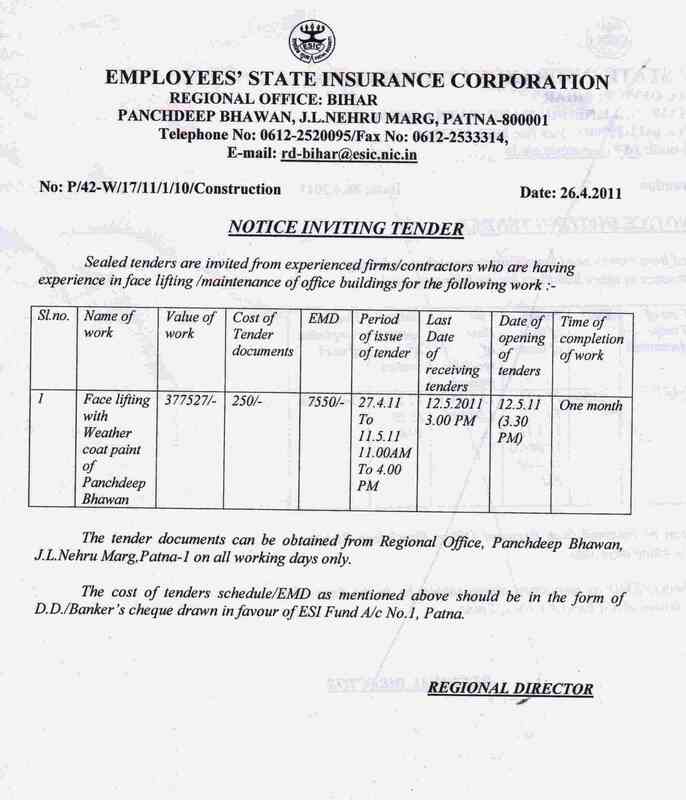 168/2011 ESIC, Assam: Advertisement for supply of manpower for House keeping work on Full Time basis / Part Time basis. 167/2011 Dir.(Med. )Delhi: Limited Tender for award of contract for Repair of wooden and steel furniture, welding and paintaing work in r/o D(M)D Office, Central Store, F.W.Project and all ESI Dispensaries in Delhi/New Delhi for the period of Two Years [Annexure-I (.pdf format)]. 149/2011 ESIPGIMSR,Joka: 1. Tender - Enquiry - 'Rate Contract' for supply of Instant hand Steriliser Solution. 146/2011 D(M)D, Delhi: Tender for providing security services in various ESI Dispensaries, Residential Colonies, Vacant plots in Delhi/ New Delhi. 138/2011 ESIPGIMSR,Joka : Tender for local purchase of drugs and dressings. 137/2011 ESICH,Adityapur : Tender Notice for empanelment of Local Chemist for local purchase of Drugs, Dressings and Disposables, Lab Kits & Chemicals / Glass Wares / X-ray films & chemicals, Other items. 136/2011 ESIC, Hqrs. : Tender Notice for Rate Contract for supply of Ayurvedic Drugs. 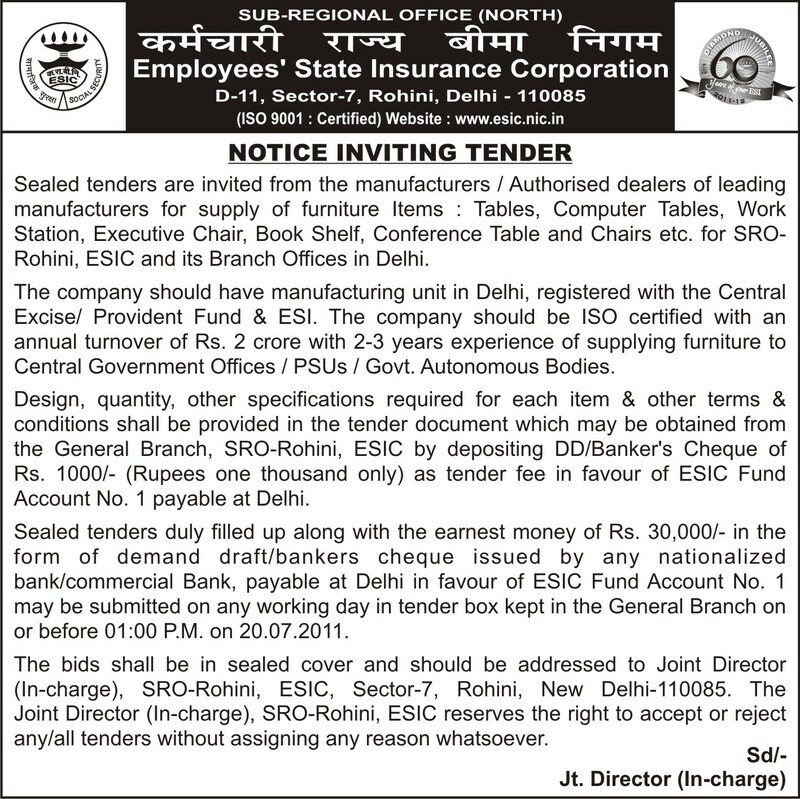 132/2011 ESIC, Rohini,Delhi: Advertisement for calling tenders in two bid system for supply of Tables, Computer Tables, Executive Chairs, Book Shelf, Conference Table, Computer Chairs, Office Chairs, Conference Room Chairs, Sofa/Steel Chair, Reception Desk. 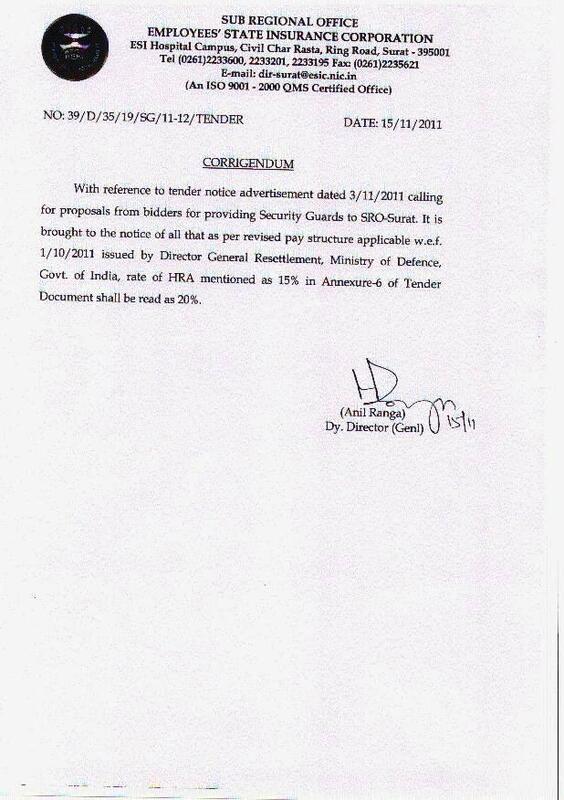 130/2011 ESICH,Okhla: Advertisement for calling of quotation regarding misc. & cleaning items. 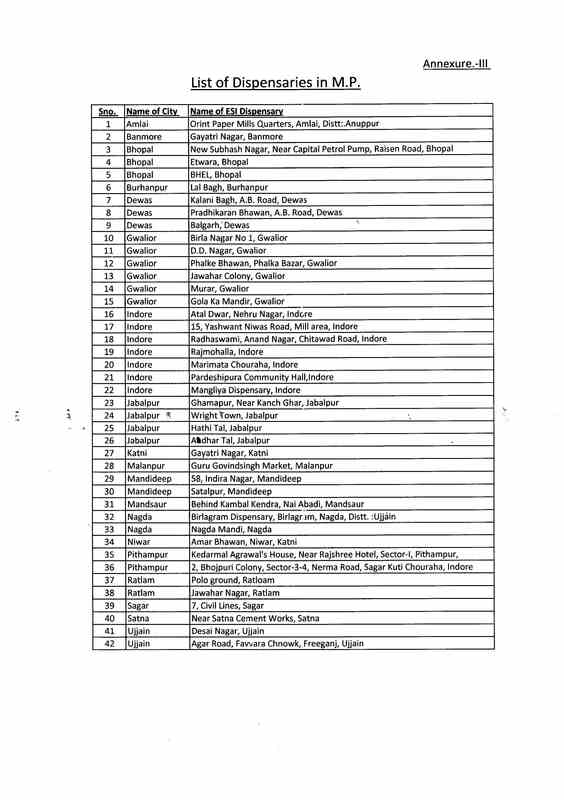 119/2011 SSMC, Gujarat: Advertisement for supply of Dispensary Kits and other General items for all ESIS Dispensaries of Gujarat Region. 117/2011 D(M)Noida: Invitation of sealed quotations for supply of branded ISI Mark drining mineral water in 20 litre pack. 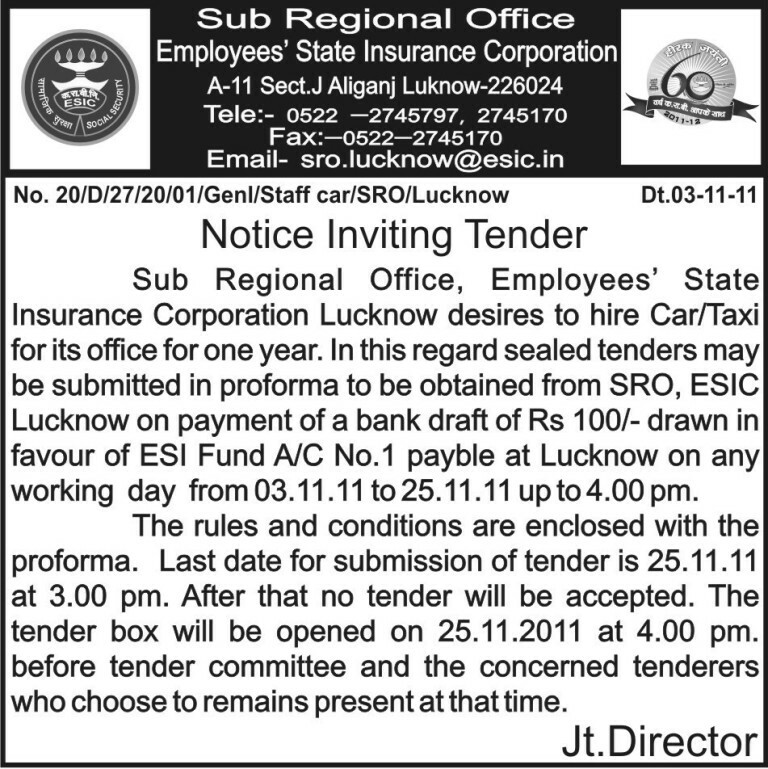 115/2011 ESIC,Bihar : Notice inviting tender under two bid system for Annual Repair & Maintenance. 2. Invitation of sealed bid for "Cryocentrifuge". 098/2011 ESIC,Guwahati : Extension Notice inviting Tender regarding annual repair and maintenance works(ARM). 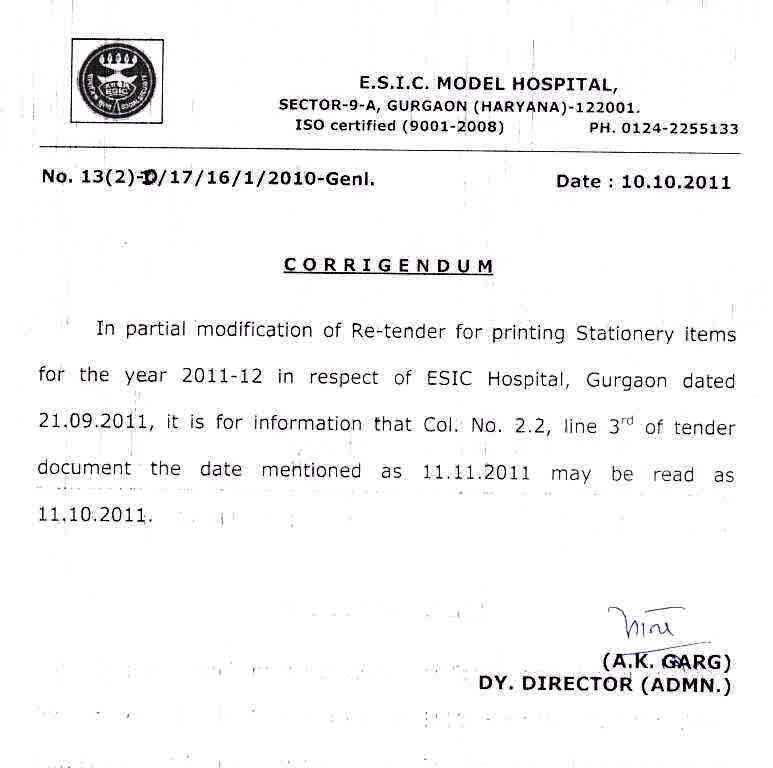 083/2011 ESICMH, Baddi : Sealed tenders are invited from Govt. Agencies/Traders for supply of linen items. Ambulance Service, on contract basis. 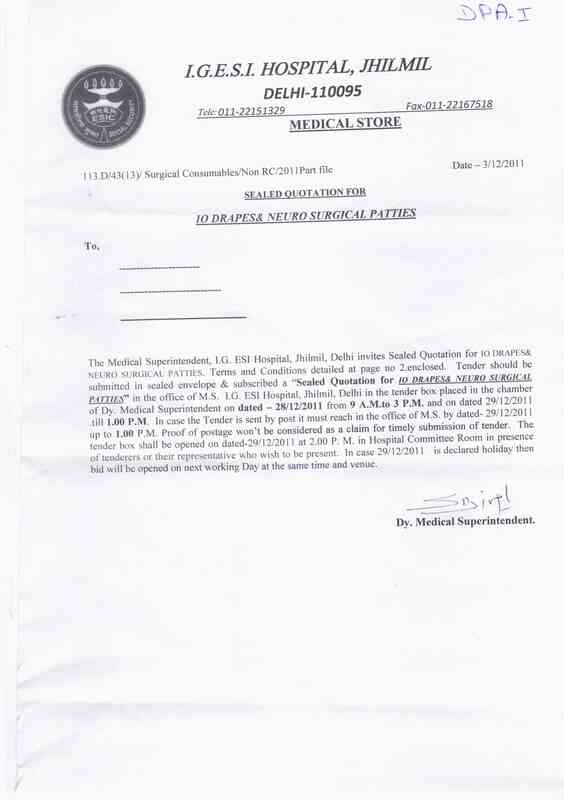 071/2011 D(M)D,Central Medical Store, Delhi : Letters regarding use/stop of different medicines in ESIC. 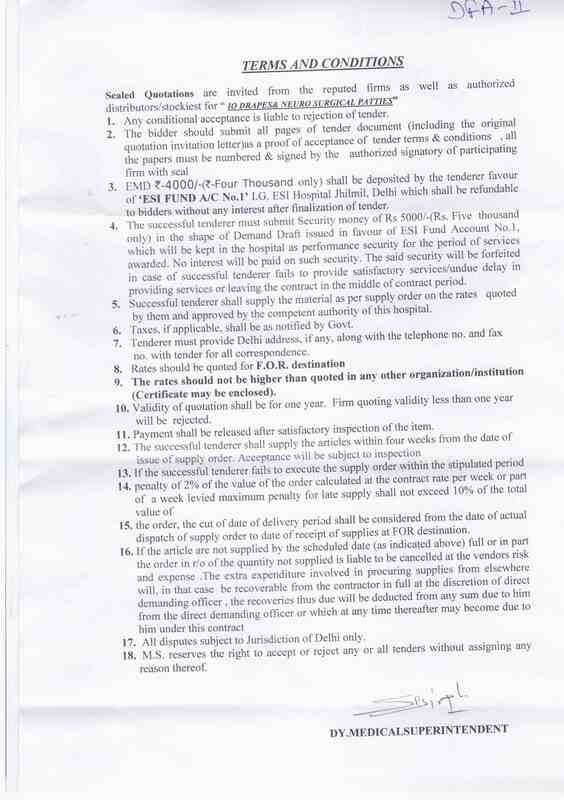 061/2011 Directorate(Medical)Delhi: Tender Notice for framing Rate Contract of ESIS in Delhi, New Delhi & Noida for the year 2011-13 in r/o Surgical Sutures. 060/2011 ESICMH, Paripally, Kollam: Tender Notice for supply of Surgical consumables chemicals, implants etc. List of items with reference to Tender Notice. 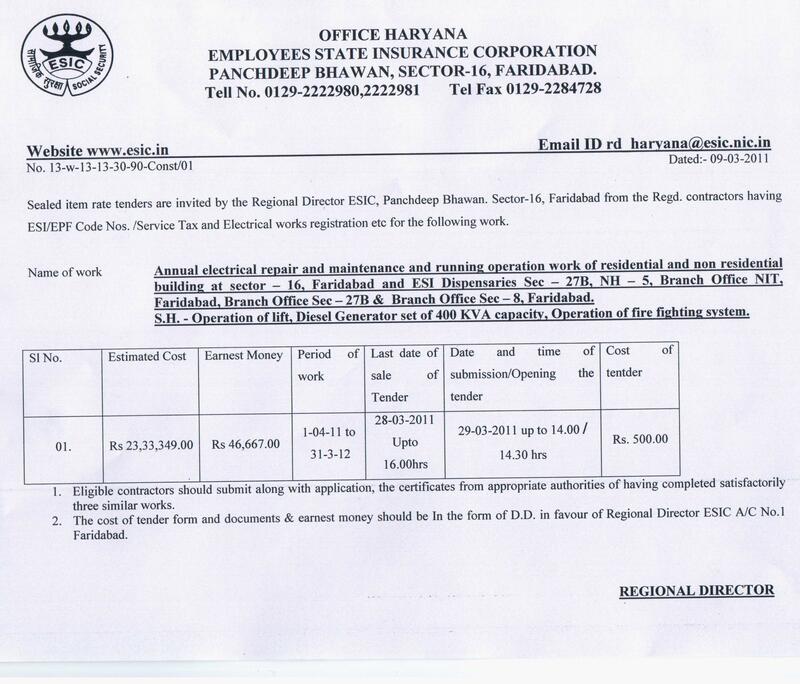 055/2011 ESIC, Faridabad : Advertisement for Annual electrical repair and maintenance and running operation work of residential and non-residential buildings of ESIC. 1. Advertisement from Authorized manufacturers/ dealers/ Importer for formation of Rate Contract for Two Years for Opthalmic Consumables. 2. Tender notice for supply of Opthalmic Consumables.